A. B. McKechnie commissioned Honeyman, Keppie & Mackintosh to make a memorial brass to his grandfather, Robert McKechnie (1781–1853), a physician, to be erected in Paisley Abbey. 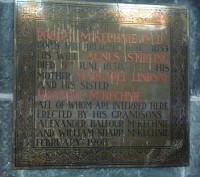 It is a modest, wall-mounted plaque in the Abbey's N. transept, also commemorating Robert McKechnie's wife, mother and sister. At the same date Honeyman, Keppie & Mackintosh carried out alterations to McKechnie's home, The Red House in Milliken Park, Renfrewshire. These two commissions are recorded together in the firm's job books.